We catch up with the award-winning Senegalese chef ahead of the opening of his new Pan-African restaurant, Teranga. Despite the subzero temperatures outside, the soft opening of Teranga had the warmth of a family gathering. 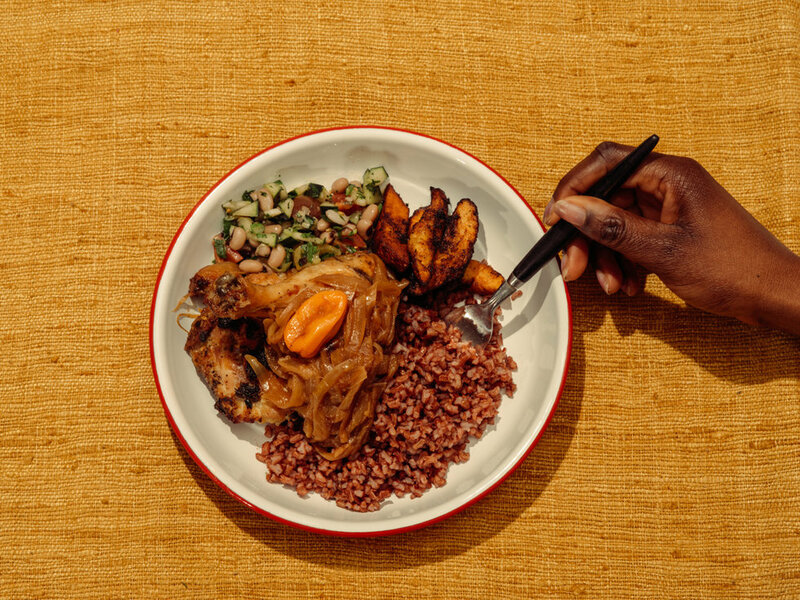 The new restaurant helmed by renowned Senegalese chef Pierre Thiam is an attempt to put a unique spin on Pan-African food in Harlem. The restaurant sits on the first floor of The Africa Center. Once known as the Museum for African Art, it reopened last year in Harlem with a broader cultural and political mission to create connections between the U.S. and Africa. Artwork from Nigerian artist Victor Ekpuk graces the walls of the new space that's reminiscent of nsibidi and uli symbols, telling the story of the Center's connection to Harlem and New York City as a whole. 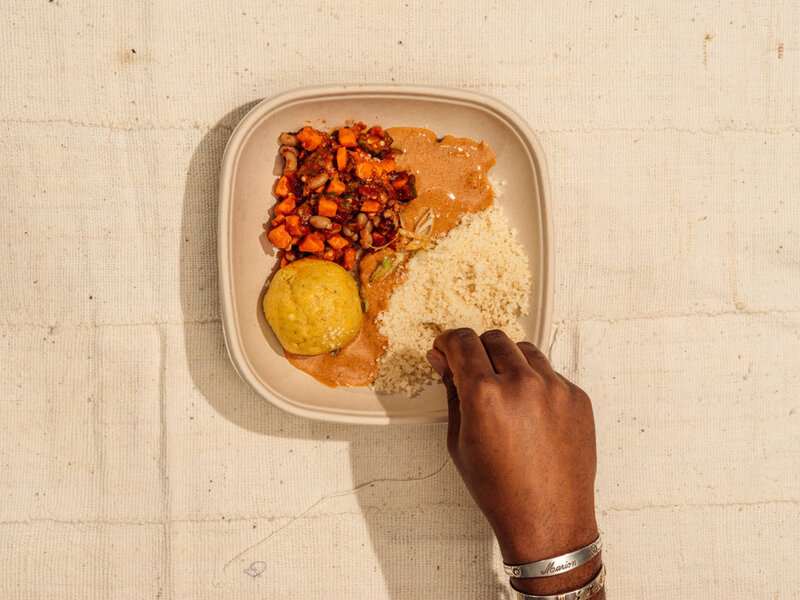 "Teranga is as much about showcasing the diversity, complexity and deliciousness of African food as it is about sharing Africa's impact on cultural traditions all over the world," Noah Levine, former executive director of the SEED Project, restaurateur and Teranga co-founder, says. "Pierre has this unique ability to be feeding and teaching you at the same time." Teranga means "hospitality" in the Wolof language and the event was a chance to show that the restaurant could live up to its name. We were provided with small bites—samples of key dishes from the menu, including a beets and fonio salad, plantain fufu with mafe (peanut sauce), attieke (cassava couscous), jollof fonio, roasted salmon with Moroccan spices and more. "Stepping into Teranga will feel like taking a journey through the depth and the diversity that the continent has to offer," Thiam explains. Plaintain Fufu and Peanut Sauce Seasonal Bowl. Photo by Cole Wilson, courtesy of Teranga. 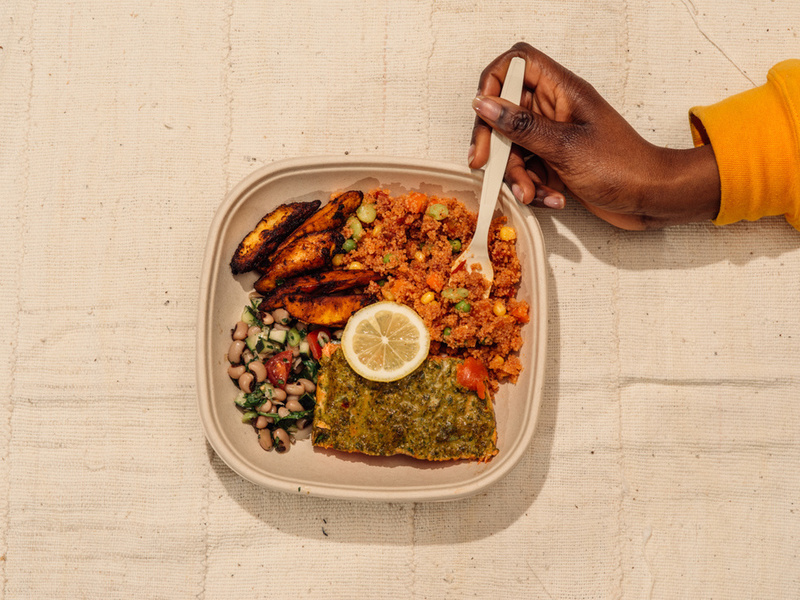 Once Teranga officially opens to the public on Feb. 9, diners can choose from a selection of pre fixe bites or build their own plates off the restaurant's modern, gluten-free take on traditional African dishes. 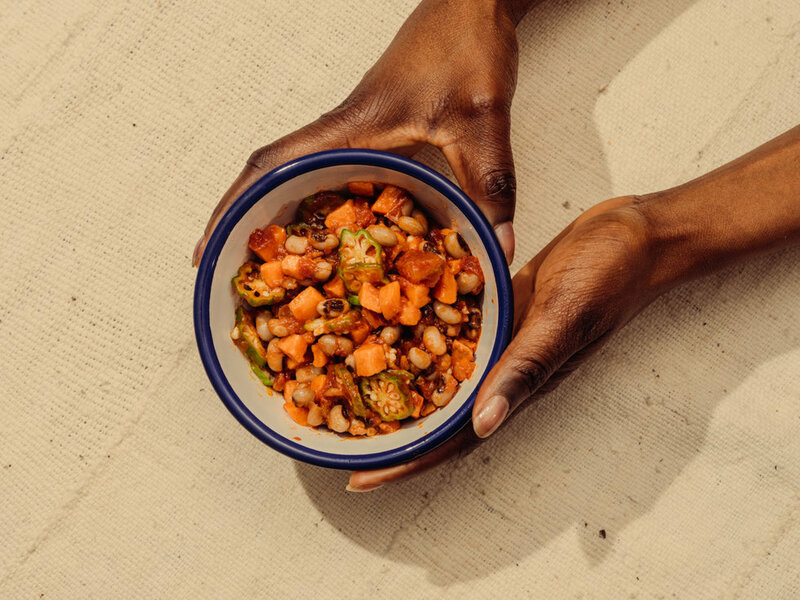 A highlight of the menu is the fonio—a highly nutritious grain that can replace many staples in African cooking. Teranga is also set to offer African coffees, teas and food products from African farmers, along with home goods, dining ware and limited-edition items from African artisans in their marketplace. Prior to Teranga's opening, we were able to touch base with Pierre Thiam to learn more about his career as a pioneering chef, fonio and his brand Yolélé Foods, as well as the importance of making room for rising young African chefs to thrive. Read our conversation with him below.This interview has been edited and condensed for length and clarity. Antoinette Isama for OkayAfrica: You ended up in New York en route to finish school but then things took a turn towards the culinary track. Can you expand on how that came about? Pierre Thiam: Cooking was never my first choice, I was looking to study physics and chemistry in university. But in a sense, it wasn't too far from cooking because cooking is chemistry. I came from a culture where the kitchen belonged to women, so that was my background in Senegal. Men never were in the kitchen, unfortunately. That's how I grew up, but I also came from a culture where food was something we valued. It's very important to us—even at lunchtime, we all take the time to come home so we can eat together. In New York, I stumbled into a restaurant job, and that's where the whole thing started. My restaurant job was at the front of the house where I worked as a busboy. That restaurant was in West Village and it took an interesting take on American cuisine. I was fascinated as a busboy—I would be taking the empty dishes from the tables back into the kitchen and I would be fascinated by what was happening back there. Everyone was from a different gender than what I knew growing up—they were all men. They were cooking up the pictures I remember seeing in my mother's cookbook—she had a collection of them when I was young since she was very into cooking too. I used to spend countless hours just looking at the pictures of the cookbook. The chef [of that restaurant] became a good friend and a mentor—he took me under his wing taught me about what he did. And I never left the kitchen since then. Yassa Yassa Seasonal Bowl. Photo by Cole Wilson, courtesy of Teranga. Beets and Fonio Salad. Photo by Cole Wilson, courtesy of Teranga. With the ventures that you've taken with your restaurants, was the main focus of your cuisine Senegalese food? My inspiration was really West African food—I think it's difficult to limit a cuisine to one border. I thought it would be much more inspiring to have West Africa be my source of inspiration rather limit to a border that's not even real when it comes to culture. What was it like building these restaurants out in a culinary world that's not very familiar with West African food? It was really, really exciting to be a pioneer and to bring more than just food, but also my culture. I knew that was challenging for different reasons because of the perception that people had of Africa. For me, the challenge was not just only to bring new cuisine to them—which was not so new. I think the most interesting part of the cuisines in this country is the African influence. When you look at Southern cuisine, which is the best in America, it's all African. I was challenged—I wanted to change that perception of Africa; I also wanted to reconnect them to the source of their cuisine. I was confident because I knew that our cuisine was delicious [and] I knew that our cuisine would be familiar to those who know Southern cuisine. I was just continuing the work of the ancestors in a way—so that was important to me. How would you describe fonio to those who aren't familiar with the grain? Fonio is an ancient grain that's probably the oldest grain in Africa, since it has been cultivated for over 5,000 years. It's one of the grains that digests really easily. It's very light and is highly recommended for folks who have diabetes and a low glycemic index. Fonio is great for the environment, as it doesn't require much work to cultivate and can grow in any condition. You'll usually find it growing in the Sahel region—so all the way from the coast of Senegal all the way to Northern Nigeria, Mali, Guinea, Burkina, Benin and some parts of Cameroon. It's a grain that can really change the economic dynamic in these countries. What are some ways one can prepare fonio for folks who want to give it a try? There are so many ways—it's a grain that's so easy to prepare because of its versatility. 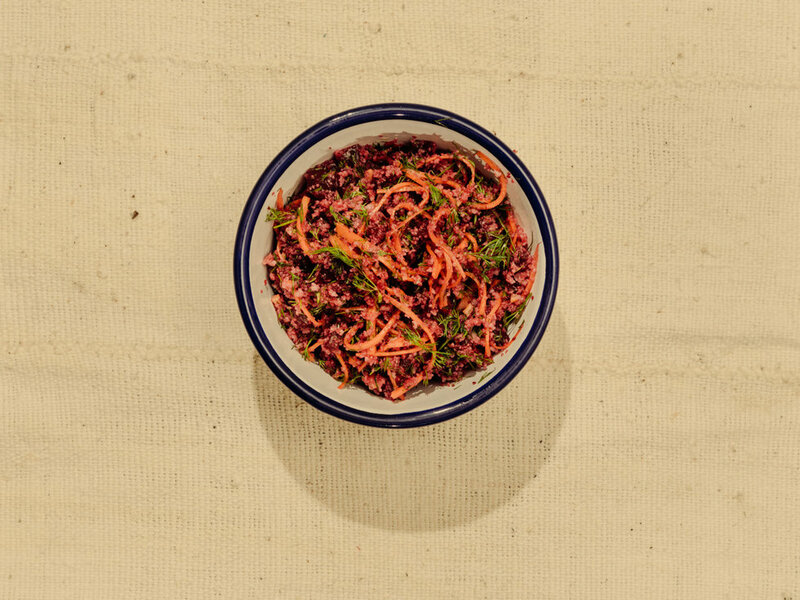 I prepare fonio depending on the weather—I make salads with it with roasted beets, dill, and pickled carrots. I use fonio in place of rice when I prepare it in a traditional Senegalese way and pair it with roasted sea bass. It can replace any grain in your recipes. Jollof Seasonal Bowl. Photo by Cole Wilson, courtesy of Teranga. Ndambe. Photo by Cole Wilson, courtesy of Teranga. Can you also touch on your involvement with Yolélé Foods and how the brand is making fonio more accessible, especially in the diaspora? At the moment we're working with cooperatives in Senegal and in Mali to produce fonio for Yolélé Foods. We're looking to expand production to other countries in the Sahel region. These cooperatives are all women-owned—it's very important to us to work with women and directly with the farmers to empower the communities that have been producing fonio for so long, to make sure they reap the benefits of this project. We have started distributing in the U.S.—Yolélé is available at several Whole Foods in New York and other local retailers, largest online natural food distributor and even Amazon. We are also available on the west coast in California and in Arizona. The list is growing and the interest is high—restaurants that aren't cooking African foods are still utilizing fonio because it's so adaptable to many other cuisines. Do you find yourself being a mentor yourself with up and coming culinary artists that also want to continue the legacy of African cuisine in the diaspora? Absolutely—I've found myself connecting with many young, very talented chefs from Africa and the diaspora, and even Westerners, you know? These are chefs who are just interested in what's happening in Africa. Along with empowering and advising them, I also get inspiration from them too—because cuisine is always constantly evolving. Is there always one piece of advice that you impart on them that you could share with those who are looking to get into the culinary world? The piece of advice I give to most of them, those of African descent particularly, is to never forget where they came from and to know that it's the most rewarding source of inspiration. The truest way to tap into the right emotion is to find inspiration in the tradition. We have the best, quality ingredients and great, traditional recipes. All the new and upcoming African chefs have to do is to revisit it and to adjust it to the times they're living in. I really encourage them not to forget that and to look at traditional food with respect and with dedication. We have to stay authentic without losing the flavors; the soul of the cuisine—while making it healthy. Teranga is located in Harlem at 1280 Fifth Avenue and will open from 7:00 a.m. to 7:00 p.m., 7 days a week. Keep a look out for diverse evening programming schedule including a dinner series, community-focused programming, and family-style dinners in partnership with The Africa Center.